There's another problem with trays that makes it resistant to social conditioning. We behave differently when we are in a hawker centre compared to elsewhere. As a Straits Times story points out, in workplace canteens, such as in the Khoo Teck Puat Hospital, we tend to be nicer people. That is also true in my office canteen here in Toa Payoh, where only newbies leave trays behind. The story attributes the returner behaviour to what it calls "unwelcome glances", which I guess in polite circles must sting like Cersei's naked walk of shame across King's Landing (for those who don't watch Game Of Thrones, it was very humiliating for Cersei). Tut-tutting works and it is how I became a returner. An auntie, a cleaner mind you, told me off (funny, she didn't think that she was tut-tutting herself out of a job, mainly because she knows when a 100 per cent return rate has been reached, her boss will move her to where her tuttage is required). So many of us know how to behave, we just don't know how, or want to, generalise that behaviour to hawker centres. There is something about those places that makes Singaporeans treat them like public conveniences. Complicating all this is the coffee shop, which is a fully staffed private business that looks, sounds and smells like a hawker centre. One environment, two different sets of behaviour expected of diners, so they pick the easier one. That is why, I suspect, that we can be trained to queue up to board MRT trains and stand to the left on the escalator and give up reserved seats - because the MRT experience is unique. There is no other cheaper, more rowdy MRT system that lets passengers act like prats. On top of that is the fact that it is so darned easy to just walk away from a mess. It is not only easy, it is a perk. 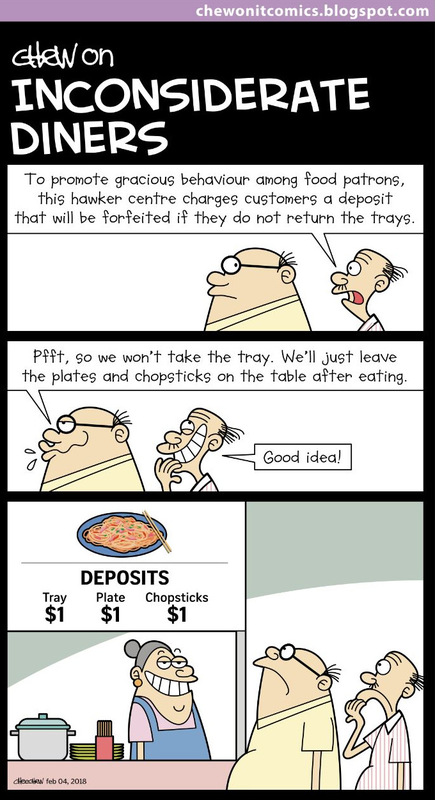 All this is why changing tray behaviour puts us on the edge of something new in campaigns: The usual carrot-stick approach of $1 trays is easily dodged, we see tray-leaving as a consumer right and the hawker centre is a large anonymous place, rather than an intimate one like an office canteen, where people we know can judge us. It is going to be a tough problem to lick for all these reasons. In my head, I have an image of a man who, finding himself in a tray-deposit place, balances a bowl of soup on his head, with a plate of chicken rice in one hand and one plate of prata in the other. Around him, impressed diners give a slow clap. You know that day is coming. We thank Miss Tan Lin Neo for her letter (Charging for trays can help change attitudes; Feb 1) and agree with her fully on the need for the people in Singapore to be more civic-minded, especially when it comes to cleaning up and returning our trays after we eat. The $1 redemption scheme that was started recently is a stopgap measure, and is yet another approach to get more people into the habit of returning trays. We hope that this habit, coupled with new food centres with tray racks that are easily visible and conveniently situated, will make the returning of trays at our food centres the order of the day. Still, it is disappointing to see some customers resisting the change that is taking place. 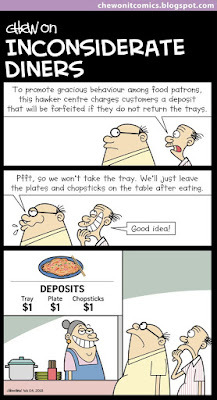 Some return their trays and leave their bowls and utensils on their table, while others reject the trays outright (Charging for trays could breed resentment, by Mr Terence Lim; Forum Online, Feb 4). Miss Tan also rightly points out that civic-mindedness must be taught at home and in schools. The Public Hygiene Council has been working closely with schools to roll out programmes aimed at instilling such social habits. But we need the help of parents to reinforce these efforts and be role models themselves. I hope that, over time, we will be able to do away with cleaners in the food centres, as more Singaporeans see the good in this act of returning trays on our own. The letter by Mr Edward Kitlertsirivatana (Don't give incentives to get people to do what is right; Feb 9) says it all. It should prick us into being ashamed of ourselves. Singapore's progress as a nation depends on not only how advanced our economy is and how modern our lifestyle is, but also on how we behave as a society, how considerate we are to one another and how well we take care of our public spaces.